Miss Blessing Bassey Okon from Etop, Akwa Ibom State was an innocent girl who was forced into prostitution at the age of 13, a time she was sup­posed to be under the care of her par­ents. Her father died immediately af­ter her birth and thereafter, her mother remarried and left her with her moth­er- in-law who could neither feed her well nor train her due in school. Coincidentally, an offer came and it was that of a professional prostitute who disguised as a businesswoman. The woman who stays in Calabar and a relation traveled home and con­vinced Blessing’s grandmother that she needed someone to assist in the shop where she sells rice. According to Blessing, the young lady gave her grandmother N4000 and took her to Calabar. “When that Aunty came to my village to pick me, she deceived my grandmother that she had a big rice shop which she wanted me to manage. She gave my grandmother some money and the old woman asked me to go with her. In fact, I was very happy because I wanted to leave the village to an ur­ban area, so I would have the oppor­tunity to engage myself in one trade or the other, since there was no one to support me”, she stated. 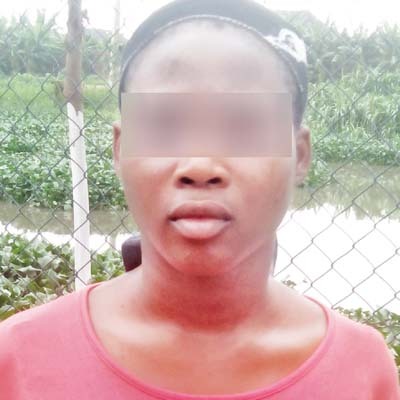 Blessing also explained that on get­ting to Calabar, her madam, instead of taking her to the shop where she would manage, she was taken to a hotel room for prostitution. “Unfortu­nately, it was when we got to Calabar that I understood that what I went to do was prostitution. She showed me a room and instructed me to ensure that I deliver enough money to her other­wise I would die of hunger. I felt bad and wondered what to do. After much thought, I remembered that I had no option than to obey her directive. So grudgingly, I started the job. I wanted to report to my mother and grand­ mother what I was going through, but due to lack of mobile phone, I could not. While doing the job, I used to de­liver between N10, 000 and N20, 000 to my madam on daily basis. It was from the money that she feed me and pay for my room. Sad enough, I was not given any cash, even when I was the one who used my body to make the money”, she said. Like other prostitutes, Blessing was busy hustling for customers and mak­ing some money for her madam. But one day, some policemen stormed the hotel and arrested her for being in the business as an adolescent. The young girl who has denounced prostitution asked God and those she has offended in the course of her business to forgive her. Gods ever faithful. You are healed permanently. Go and get tested medically, I pray your healing shall be permanent. This girl as been scarred, violated and exposed to a terrible world at a very tender age it will take the grace of God, and support from loved ones to reshapen her psychologically. what sort of mother will do this to her child bcos u want to av a man in ur life u forsake ur own daughter, all dis people should be arrested and dealt with for every wrong done to dis innocent girl. But pls girl u need to go for proper medical checkup just to ascertain ur HIV status. I can see she is so naïve and doesn’t really know much, she needs a lot of enlightment. It appears that your mother and your grandma were all privy to this wicked plot. This is how countless other girls are driven into this base biz of prostitution. But it is not a justification to remain in it. Thank God that you have seen the Light. May it be permanent what the Lord has done for you! Don’t forget to go for a medical check-up. Warmest regards and may God continue to bless you! So touching story,I believed God can change any situation. your faith have cured you, just go get tested again OK.
You are welcome back to our Lord Jesus Christ. Surely God will grant you help. Welcome once more. Sometimes when you see a barren woman, dont blame it on God, cos some women can be irresponsible just like the mother of this girl in question. Some women dont really deserve to be mothers. Sorry baby girl, the Lord is your strenght. Its well with you. Stop assuming go nd run a test. Tnk God 4 ur life sis blessing.